I had a script writing triumph happen to me recently. The Stillwater, Oklahoma Arts & Humanites Council hosts an annual festival of short plays appropriately named The Shorts Festival. This year it was the weekend of May 20th and 21st. I attended a luncheon catered by Forman Harley Davidson and then went over to Town & Gown Theatre to watch the six plays that were selected for performance. I was fortunate enough to have a great cast and director in charge of my play "This Is Not A Suicide Note." Directed by Kim Harrison, the cast included Bennett Frohock, Anna Smith Gartner, and Jay Kuruvilla. I met them all at the luncheon and I knew right away, they were going to hit a home run with their performances. As it turns out, they nailed the play and stole the show. Their abilities helped me win the Audience Choice Award for Best Play in the festival. Woohoo! Awards are awesome! I can't thank enough the four people that took my play and made it shine. 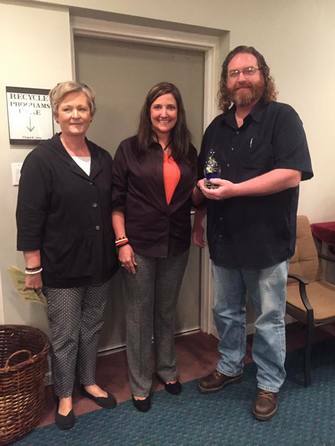 In the top photo, with me and my new trophy, are Debbie Sutton (Left), President of the Arts & Humanities Council of Stillwater and Megan Phillips (Center) with the charity Kickin' Childhood Hunger. All proceeds from the weekend went directly to them to help support their noble effort of keeping hungry kids fed. 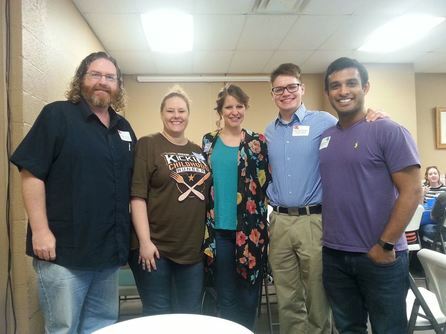 In the bottom pic along with me are (L to R) Kim Harrison, Anna Smith Gartner, Bennett Frohock, and Jay Kuruvilla. Well done players!